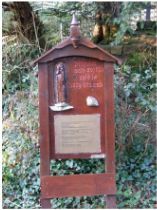 It's reported that there are approximately 3,000 Holy Wells in Ireland and that there's barely a parish in the country that doesn't have at least one holy well. Please help me to try to identify as many of these wells as possible. Check HERE to make sure your local well is recorded in the list of wells in the country. Please contact me by e-mail below if your local holy well is not recorded or if there are any inaccuracies in the record. How many holy wells can we find in the country? If anyone wishes to send me some information on your local holy well, I'll include it on the list of holy wells. If you have a photo of your local holy well, you can also send that to me and I'll put it up. 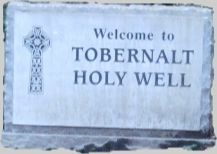 Tobernalt, one of a number of holy wells throughout Ireland, is situated in a remote and peaceful location, surrounded by woodland and adjacent to the shores of Lough Gill, Co. Sligo. It is a place of beauty, peace and tranquillity. It is also a place of popular religious devotion for many years where people come to pray. One of the most picturesque holy wells in Ireland is that which is known as Tubbernaltha, on the shores of Lough Gill, near Sligo. The well gushes out from the face of the cliff to which it owes its name. The pellucid stream at first lingers under the shade of embowering shrubs, the centre of a scene of enchanting loveliness, and then steals away with gentle murmur to mingle with the waters of the lake. The well has a double sanctity, for it was not only blessed by St. Patrick who, it seems, baptised his converts on his way southward through Tirerrill, but in the Penal days its waters were used in the celebration of mass, which was solemnised there beneath an aged tree when no priest dare venture into the town of Sligo. "The pilgrimage to Tobar an Ailt, about three miles from Sligo town, is still very popular. It is beautifully situated in a natural grove and the trees, in full leaf on the pattern day, give a soft dim light like the inside of an old church, where people prayed silently or spoke softly. The well of lovely cold, clear water bubbles up at the foot of a steep rock face and flows off towards Loch Gill a short distance away. I noticed that there were many hazel trees growing close to the stream and the nuts from the trees could fall into the water. A little way up the steep rock face, a modern altar has been built where mass was said twice on the pattern day - the last Sunday of July. 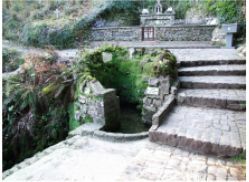 The praying stations around the well, fourteen of them, are referred to as "altars". Each "altar" - some of them are no more than small heaps of stones - is marked with a small modern cross made of marble numbered I to XIV, as on the Stations of the Cross in a Catholic church. The well is in a valley which runs down to Loch Gill and just off shore there is an island called Inishmore which contains the ruins of an ancient church. A little way along the shore is Toberconnell Bay and an island dedicated to St. Connell. The name of the townland, Clochermore, would indicate the presence of a church, and it also contains an old graveyard, which may be where the church was." Here are memories of a poor, persecuted people. At the risk of their lives. They have handed us a torch. Let us keep that torch alight.